AMD had quite a presence at CES and generated great levels of interest with its next generation Ryzen CPUs, supporting motherboards, coolers, and systems makers, plus Vega GPUs. We saw the AMD Vega GPU architecture uncovered officially mid-week, and at its exhibition space at CES, AMD showcased dozens of Ryzen systems. At least one system on show was demonstrating the power of a combined Ryzen CPU and Vega GPU-based system running Star Wars Battlefront at 4K Ultra. 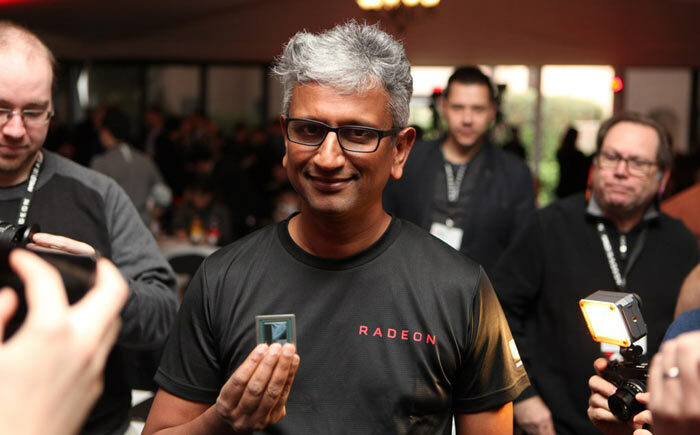 Head of RTG Raja Koduri was pictured holding a Vega chip during CES - but what about the graphics cards? We didn't get a glance of one of them, until now. Linus, of the Linus Tech Tips website, published a behind-the-scenes video yesterday, showing an engineering sample AMD Vega graphics card inside one of AMD's test systems at CES. In the video entitled 'Hands LITERALLY On AMD Vega' he takes the side panel off a Ryzen/Vega PC running a DOOM demo (video 2m 30s onwards), and noses about before chatting to Mr Koduri about Vega. The large obscure pieces of sticky tape cover up the telltale power connector(s), and other such components which might reveal a little too much too early, explained Linus. The engineering card in use has a 2-inch extension with blue USB 3.0 port which Raja Koduri joked would remain on a "special edition" for himself and Linus. Koduri said the USB connector is there for the engineers to easily monitor all power and electrical signals when the card is in use without overhead. All interesting stuff. Views inside the PC chassis revealed a Vega engineering sample card with a dual-slot air cooled design. The card is quite long even without the USB appendage and, even though it's an engineering sample, sports the LED backlit Radeon logo. I am a bit worried about the card length, even without the extra USB diag on the back end that think looks far far too long. Especially when you consider that they are using HBM2 memory for it. One of the reported benefits of doing so was to cut down the amount of card space you needed as all the memory is on the chip package vs GDDR5 which takes up a lot of board space around the gpu chip. Hopefully the retail versions will have a much more refined design. If the ES is nothing like the retail boards are going to be I'm surprised they would let any pics be shown of it at all. I understand the tape on the PCI slots (to stop anyone peeking through there to see the cables), but why the tape on the case fan?